The planned first manned flight of the Apollo CSM, the Apollo C category mission. The crew was killed in a fire while testing their capsule on the pad on 27 January 1967, still weeks away from launch. Set back Apollo program by 18 months. AKA: Apollo 1. Launched: 1967-01-27. Number crew: 3 . Originally planned for the last quarter of 1966. Numerous problems with the Apollo Block I spacecraft resulted in a flight delay to February 1967. The crew was killed in a fire while testing their capsule on the pad on 27 January 1967, still weeks away from launch. 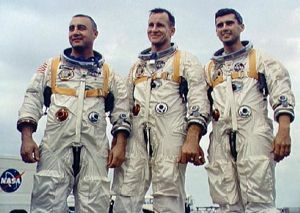 The designation AS-204 was used by NASA for the flight at the time; the designation Apollo 1 was applied retroactively at the request of Grissom's widow. Apollo 205, a second solo flight test of the Block I Apollo CSM, was planned but cancelled on December 22, 1966. 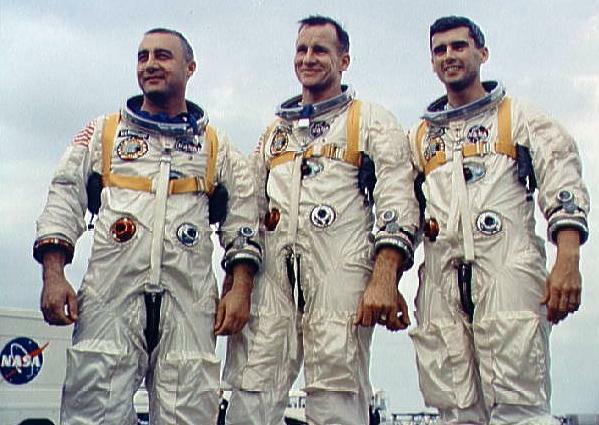 The Schirra, Cunningham, Eisele crew from that flight became the backup crew to Apollo 204 (replacing the original backup crew of McDivitt, Scott, Schweickart). People: Schirra, Grissom, McDivitt, Eisele, White, Cunningham, Scott, Chaffee, Schweickart. Country: USA. Projects: Apollo. 1965 July 23 - . 1965 September 15 - . 1965 September 16-October 15 - . Apollo CSM 012 considered for the first manned Apollo flight - . Nation: USA. Program: Apollo. Flight: Apollo 204. North American evaluated the compatibility of spacecraft 012 with its mission, AS-204, the first manned Apollo flight. The manufacturer determined that, by using roll-stabilized attitude during most of the flight, the vehicle could remain aloft for about 13½ days. The only onboard expendables termed marginal were cryogenics and the propellant supply in the SM's reaction control system (which, for added safety, would offer a redundant means of braking the vehicle out of orbit). Apollo AS-204 experiments revised - . Nation: USA. Related Persons: Shea. Program: Apollo. Flight: Apollo 204. ASPO Manager Joseph F. Shea recommended to Apollo Program Manager Samuel C. Phillips that experiment M-5A (Bioassays Body Fluids) not be incorporated on mission AS-204, based on schedule impact resulting from structural modifications necessary to support the Urine Volume Measuring System. Redesign and rework of existing spacecraft hardware would have a schedule impact of two to four weeks. 1966 July 13 - . Launch Vehicle: Saturn V.
Apollo mission discontinuity leading to the lunar landing - . Nation: USA. Related Persons: Kraft, Shea. Program: Apollo. Flight: Apollo 204, Apollo 7. Spacecraft: Gemini. Apollo AS-204 Design Certification Review - . Nation: USA. Program: Apollo. Flight: Apollo 204. 1966 November 29 - . 1967 January 3 - . 1967 January 26 - . Launch Vehicle: Saturn V.
Findings of the S-IVB Accident Investigation Board supplemented - . Nation: USA. Program: Apollo. Flight: Apollo 204. 1967 January 28 - . 1967 January 29 - . 1967 January 30 - . Launch preparation for Apollo AS-501 to proceed as planned - . Nation: USA. Program: Apollo. Flight: Apollo 204. 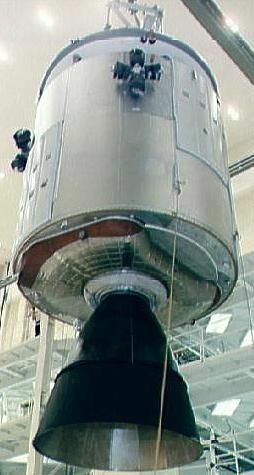 Spacecraft: Apollo CSM, CSM ECS. A TWX from NASA Headquarters to MSC, MSFC, and KSC ordered checkout and launch preparation of AS-501 to proceed as planned, except that the CM would not be pressurized in an oxygen environment pending further direction. If AS-501 support, facility, or work force should conflict with the activities of the AS-204 Review Board, the Board would be given priority. Apollo 204 Review Board of advised of accident in an altitude chamber at Brooks Air Force Base - . Nation: USA. Program: Apollo. Flight: Apollo 204. 1967 February 1 - . 1967 February 14 - . 1967 February 17 - . 1967 February 21 - . 1967 February 22 - . Briefing on progress of the Apollo 204 Review Board - . Nation: USA. Program: Apollo. Flight: Apollo 204. 1967 February 23 - . 1967 February 25 - . 1967 February 27 - . 1967 March 1 - . 1967 March 6 - . Criteria established to resume Apollo testing in an oxygen environment - . Nation: USA. Program: Apollo. Flight: Apollo 204. 1967 March 7 - . Launch Vehicle: Saturn V.
Impact of the Apollo 204 accident on schedules - . Nation: USA. Program: Apollo. Flight: Apollo 204. 1967 March 8 - . Apollo 204 Review Board follow-up report - . Nation: USA. Related Persons: Faget. Program: Apollo. Flight: Apollo 204. Maxime A. Faget, MSC, presented the Apollo 204 Review Board a follow-up report on analysis of the arc indication on the lower-equipment-bay junction-box cover plate. The plate had been delivered to the KSC Material Analysis Laboratory and, in addition to the analysis of the arc indication, molten material found on the bottom of the plate would also be analyzed. 1967 March 10 - . 1967 March 13 - . Apollo 204 Review Board test results failed to show any SM anomalies - . Nation: USA. Program: Apollo. Flight: Apollo 204. Spacecraft: Apollo LM, CSM Electrical, LM Electrical. 1967 March 16 - . Tight schedule as a result of Apollo AS-204 accident - . Nation: USA. Program: Apollo. Flight: Apollo 204. 1967 March 18 - . 1967 March 18-19 - . 1967 March 19 - . 1967 March 20 - . Apollo-Saturn 204 launch vehicle to launch the first lunar module - . Nation: USA. Program: Apollo. Flight: Apollo 204. Spacecraft: Apollo LM. NASA announced it would use the Apollo-Saturn 204 launch vehicle to launch the first lunar module on its unmanned test flight. Since the 204 vehicle was prepared and was not damaged in the Apollo 204 fire in January, it would be used instead of the originally planned AS-206. Langley custodian of all materials dealing with the Apollo 204 accident - . Nation: USA. Program: Apollo. Flight: Apollo 204. 1967 March 21 - . 1967 March 25 - . 1967 March 25 - April 24 - . Designations for Apollo / Apollo Applications missions - . Nation: USA. Program: Apollo. Flight: Apollo 204. 1967 April 5 - . Apollo 204 Review Board final report - . Nation: USA. Program: Apollo. Flight: Apollo 204. 1967 April 21 - . 1967 April 25 - . 1967 May 1 - . 1967 May 4 - . Apollo mission redesignations - . Nation: USA. Related Persons: Mueller, Phillips, Samuel. Program: Apollo. Flight: Apollo 204. Directions had been prepared to designate mission AS-501 formally as Apollo 4, AS-204/LM-1 as Apollo 5, and AS-502 as Apollo 6, NASA Apollo Program Director Samuel C. Phillips informed Associate Administrator for Manned Space Flight George E. Mueller. Phillips said he thought it was the right time to start using the designations in official releases and appropriate internal documentation. Mueller concurred. 1967 May 9-10 - . NASA reported to Congress on actions taken on the Apollo 204 Review Board's findings - . Nation: USA. Program: Apollo. Flight: Apollo 204. NASA reported to Congress on actions taken on the Apollo 204 Review Board's findings and recommendations concerning the January 27 spacecraft fire. Administrator James E. Webb, Deputy Administrator Robert C. Seamans, Jr., and Associate Administrator for Manned Space Flight George E. Mueller testified before the Senate Committee on Aeronautical and Space Sciences May 9 and before the House Committee on Science and Astronautics' Subcommittee on NASA Oversight May 10. 1967 May 20 - . Contract for three additional Apollo CSMs requested - . Nation: USA. Program: Apollo. Flight: Apollo 204. Spacecraft: Apollo CSM, CSM Block II. MSC notified NASA Hq. that - with the changes defined for the Block II spacecraft following the January 27 Apollo 204 fire and with CSM delivery schedules now reestablished - it was necessary to complete a contract for three additional CSMs requested in 1966. North American Aviation had responded September 15, 1966, to MSC's February 28 request for a proposal, but action on a contract had been suspended because of the AS-204 accident. NASA Hq. on June 27, 1967, authorized MSC to proceed. 1967 May 26 - . Apollo 204 Review Board completes work - . Nation: USA. Program: Apollo. Flight: Apollo 204. Apollo 204 Review Board Chairman Floyd L. Thompson wrote NASA Deputy Administrator Robert C. Seamans, Jr., "The Apollo 204 Review Board respectfully submits that it has fulfilled all of its duties and responsibilities as prescribed by the Deputy Administrator's memorandum of February 3, 1967. Accordingly, it is requested that the Apollo 204 Review Board be dissolved." Changes resulting from AS-204 investigation - . Nation: USA. Program: Apollo. Flight: Apollo 204. Spacecraft: Apollo CSM, CSM ECS, CSM Electrical, CSM Hatch. 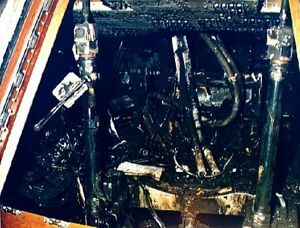 ASPO Manager George M. Low issued instructions that the changes and actions to be carried out by MSC as a result of the AS-204 accident investigation were the responsibility of CSM Manager Kenneth S. Kleinknecht. The changes and actions were summarized in Apollo Program Directive No. 29, dated July 6, 1967. 1967 September 21 - . 1967 September 22 - . Apollo LM weight growth - . Nation: USA. Program: Apollo. Flight: Apollo 204. Spacecraft: Apollo LM, LM Ascent Propulsion, LM Descent Propulsion, LM Landing Gear. 1968 April 16 - . Results of Apollo boilerplate 1224 tests in a 60%-oxygen / 40% nitrogen cabin atmosphere - . Nation: USA. Program: Apollo. Flight: Apollo 204. Spacecraft: Apollo CSM, CSM ECS. 1968 August 30 - . Apollo Special Task Team at North American mission ended - . Nation: USA. Related Persons: Rees. Program: Apollo. Flight: Apollo 204. Eberhard Rees, Director of the Apollo Special Task Team at North American Rockwell, notified the contractor that facilities the team had used at Downey, Calif., were relinquished to the company. Thus ended the mission of the group formed some nine months earlier to oversee the contractor's preparations during the period of adjustment following the Apollo 1 accident. 1969 March 11 - . Launch Vehicle: Saturn V.
Cost of the Apollo 204 fire $410 million - . Nation: USA. Related Persons: Mueller. Program: Apollo. Flight: Apollo 204. Spacecraft: Apollo LM. The additional direct cost to the Apollo research and development program from the January 27, 1967, Apollo 204 fire was estimated at $410 million, principally for spacecraft modifications, NASA Associate Administrator for Manned Space Flight George E. Mueller testified in congressional hearings. The accident delayed the first manned flight of the spacecraft by about 18 months. "During this period, however, there occurred a successful unmanned test of the Lunar Module and two unmanned tests of the Saturn V vehicle."